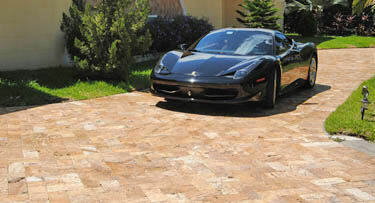 Travertine Pavers, Concrete, Brick & Artistic Selections in Miami Dade County, Broward County & Palm Beach County. “I am astounded that Ross Services installed pavers on my pool deck and back porch AND re-coated my swimming pool, all within 5, yes FIVE, days! We signed a contract on April 24, and they began Monday (May 6) and finished this afternoon (May 10). I can't believe it! The deck and pool look fantastic. I would absolutely use Ross Services again, and, in fact, I plan to for my next project (driveway)! I highly recommend Ross Services!" 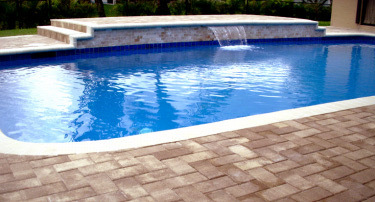 Our company specializes in complete pool deck remodeling and resurfacing in Fort Lauderdale and cover all of South Florida as well. No remodel or resurface job is too small or too complex for us. We can do anything from pool pavers, waterfalls, travertine deck installation to pool resurfacing and complete patio remodeling all within 1 week! We offer free inhome estimates and design for any new or existing customers. 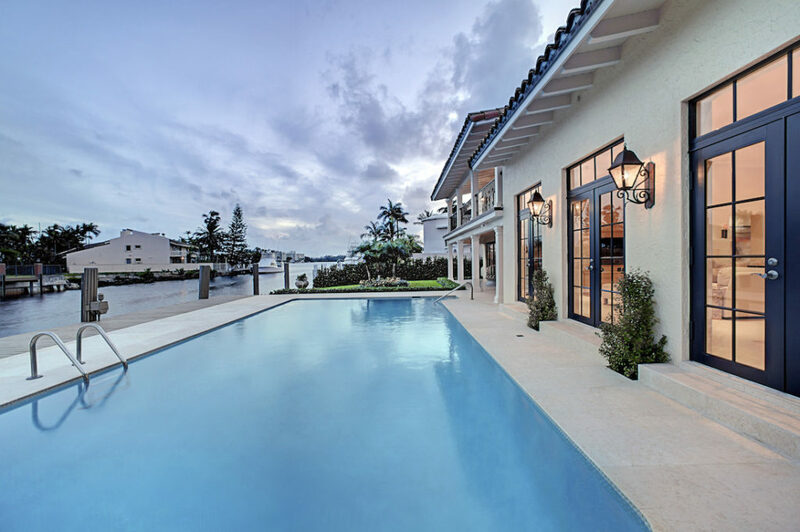 Unlike most pool remodeling companies in Fort Lauderdale, we offer a 3 year warranty that we stand behind for the piece of mind of our customer. 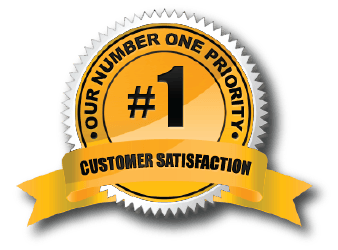 We are pool, patio remodel & resurfacing experts that value our reputation as much as we value our customers. I am astounded that Ross Services installed pavers on my pool deck and back porch AND re-coated my swimming pool, all within 5, yes FIVE, days! We signed a contract on April 24, and they began Monday (May 6) and finished this afternoon (May 10). I can't believe it! The deck and pool look fantastic. Brian was a complete professional, explaining the process to me, saying how long it would take, always answering my calls, and keeping an eye on everything. He was very nice to deal with, and a man of his word. The price was more than fair, and he included some nice up-grades at no extra charge. I would absolutely use Ross Services again, and, in fact, I plan to for my next project (driveway)! I highly recommend Ross Services! Brian Ross, the owner, drove an hour up to Palm Beach County to give us an estimate on April 24th. He came prepared with photos and sample stones. Brian suggested the travertine and also gave us the idea of making a path from the patio to our shed - something we never thought of before. We chose the French design (5 stones of different sizes) and the travertine stone that had gold and red tones. May 7th the stone was delivered and on May 8th a crew of 5 finished the job in one day! They were steady, hard workers and willingly made the few changes we suggested. Brian was present for the first few hours of the work to make sure everything was progressing correctly. We are very pleased with how the patio turned out. The travertine stones are beautiful, each one having a different veining pattern. I pointed out to Brian one I particularly liked and he said my husband and I would each end up having a "favorite" stone! We are happy to recommend Ross Services. I called 3 "A" rated companies on Angie's List. One had an answering service that scheduled a visit too far in advance, the second one never called back, and the 3rd one, which was Ross Services called me back promptly. Brian, the owner, met with me the following day. He came well prepared with his portfolio and samples. Because it was difficult to match the existing pavers, Brian offered ideas for directions we can go. He was open to my ideas as well as my wife's and came off very accommodating to our designs. The job was started 2 days later and the crew was punctual. To my amazement, the work was completed in about 4 1/2 hours and all debris was removed. It was a pleasure working with Brian. Even though this was a small job, he treated me as if I was his largest customer. I didn't get competitive bids, but the price seemed to be reasonable and within my budget. Finally, the job came out beautifully and as designed. I certainly would contract with this company again, it's a business card worth keeping. I have been a resident of South Florida for over 40 years, so as you can imagine, I have had the good, bad and ugly companies employed during that time, in all kinds of categories. I have to say that Ross Services met and exceeded all expectations for this rather large and somewhat expensive project. First, I did my research. This was the first time I used Angie's List and it made me a believer. I found that Ross Services had been in business for quite some time and had no complaints, not with Angie's list or the BBB. (other companies I checked out had some, and some had many). The salesman arrived right on time. The price was competitive but a bit more than other quotes. The company tweaked the price enough to bring me around and though still not the cheapest quote I got, I just felt comfortable with the overall reports and response of the company. The project started a bit late due to city permits, but when started, they continued until it was complete, including all cleanup and the agreed upon landscaping. The final payment was submitted when final inspection concluded. The job was BEAUTIFUL. Each crew (tear out, prep work, concrete work, clean up and sprinkler system) was more polite than the last. Real easy to work with. Explanations were available at each turn. This is a GREAT company, in my opinion. You can't go wrong with them. The experience was positive from beginning to end. Before commencing the work, Joel brought the team leaders to the house to go over what had to be done. The work began once the pavers that we wanted were on hand. The workers showed up when they said they were going to be here; they coordinated their work flawlessly and carried out their jobs with great professionalism and attention to quality. Joel stayed involved and kept me informed when minor schedule changes were necessary. The work was finished when promised, and my wife and I are extremely pleased with the end result. Ross Service was the only company we contacted that could perform all the elements of the work that had to be done, saving me the task of coordinating among several providers. Once the job was completed, Joel came by to make sure that everything was done to my satisfaction, and readily agreed to some minor touches that I requested. I can recommend Ross Services without any reservations. They are pros. We received an estimate for the complete renovation of our swimming pool with the installation of travertine pavers for the decking as well as the front walk and a screen room added. The estimate was several thousand dollars less than other estimates that had fewer upgrades. We dealt directly with the owner. He promised that all the work would be done in a week. As skeptical as we were having experienced south Florida contractors and their "schedules", we signed a contract. Part of the decking was raised 12 inches, a 6-foot water feature was added, the return was moved, the surface of the pool was Diamond Brited and a new LED pool light was installed. Seven days later the pool was finished and we couldn't be happier with the results! The owner is a man of his word and insists that if anything comes up, let him know and he'll take care of it. We trust him to do as he promises.